The coastal resort of Brighton has always been renowned for having interesting buses. In the past the companies of Southdown, Brighton Hove & District and Brighton Corporation have graced the streets with famous names like AEC, Leyland, Bristol, Guy as well as a smart fleet of trolleybuses. Now in the twenty first century all that has changed, however Brighton still boasts an eclectic mix of modern buses. 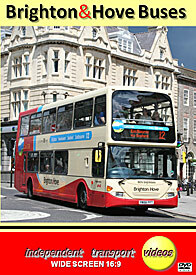 Services today are chiefly in the hands of the ‘Brighton & Hove Bus and Coach Company’, which is part of the GoAhead group. In the early summer of 2011 the independent transport videos cameras made a visit to the city to record the current bus scene. The programme opens on the famous Marine Parade where we see buses operating on a number of coastal services, after which our cameras move to Old Steine covering a number of vantage points. Most varieties of Brighton’s contemporary buses are seen including the recently introduced Wright bodied Volvo B9TL’s numbered 401 to 421 operating mostly on services 6 and 7. Our cameras move further inland to capture buses passing the magnificent Brighton Pavilion before venturing to North Street for some fast paced action with numerous examples of Dennis, Scania and Volvo vehicles alongside Enviro 300s and 400s from the Stagecoach fleet. We film at a number of locations along North Street including the busy junction with Queen’s Road where we witness long processions of buses climbing the hill towards Churchill Square – our next location. From here we move along Queen’s Road capturing the action before we reach the small bus terminus outside Brighton railway station. The ornate backdrop of the station provides a contrast with the newest additions to this modern fleet. We return via North Street to Old Steine where we film one of the articulated Mercedes Benz Citaro buses on the university service 25 as well as a Plaxton President from sister company, London General. A final visit to Marine Parade is made before we take a look at operations in the busy suburb of Portslade. Here we see the buses operating along the leafy suburban avenues, local shopping streets and railway station. Our final scenes are taken on a glorious summers’ day at the gentile seaside town of Eastbourne, where we capture Brighton & Hove buses newly branded for the route 12 group of ‘Coastal’ services. If you enjoy seeing a smart contemporary bus fleet in everyday action this is the programme for you! Duration : 86 minutes (approx).